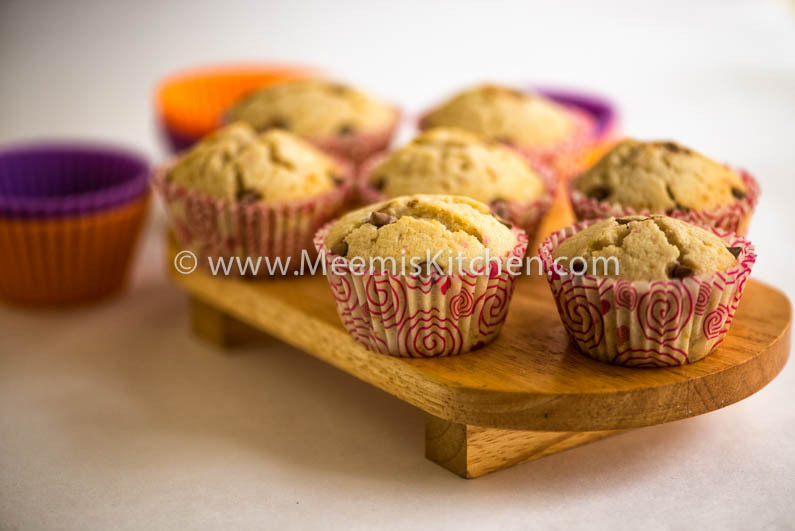 Black Currant Muffins are easy to make mini wonders that can light up the face of any kid. We can make this with Black currant crush that is available in Supermarkets and Online stores. It is really simple to make. Any child with a fascination for baking can try this and you can just help them with the baking part. I always make Black Currant/ Strawberry cupcakes as snacks for my children, and also for their birthday parties. You can play around with various toppings, cream, icing or just have it plain. Baking with children is a great way to spend time together, and it will create many lasting memories. Kids love the baked goodies be it cakes or Breads like Garlic Bread, Sausage rolls, Egg Puffs etc. and although it will always leave a messy work area and lot of cleaning up work (take their help as well), it is still fun time. Tessa (my daughter), loves making these cupcakes, it s really that simple! You can also try with your children; It is quite easy to prepare and takes so less time. You can teach your kids how to mix the ingredients and fill the cupcakes and also to decorate. And help them put the same in oven for baking. Check for more cake recipes under the Baker’s Basket. So put that apron on and wear your baking gloves, we will start right away. Sift Flour, Sugar, Baking Powder together (Sift three times). 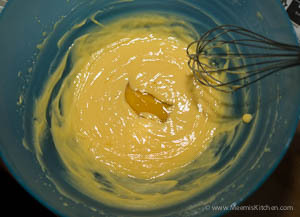 Melt the butter in a bowl and melt in a double boiler or in a microwave. Beat with an egg beater nicely and add egg one at a time. Add milk and beat again. Add the essence and the crush and mix well. 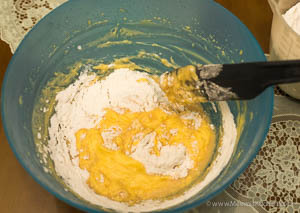 Add the flour and mix and fold in with a spatula slowly. Preheat the oven on 180oC. 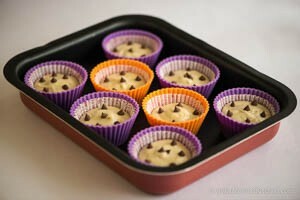 Arrange the muffin moulds in a tray and fill each paper cup till 3/4th part. Arrange the cashews/ Chocolate chips/ Raisins on top. Bake in the oven for 20 – 22 minutes. Enjoy your Black currant muffins. Sift flour, Sugar and Baking powder three times to mix it well. Black Currant crush is available online or in supermarkets. If you have Black Currant Jam, you may substitute it for crush. If it is sweet, add two tbsp. jam but reduce 1 tbsp sugar to balance the sweetness. You can also decorate with cream toppings or chocolate glazing on top of the muffins. Check Bakers Basket for more toppings recipes. The muffins will be ready in 20 minutes, however check by inserting a small toothpick into it and if it comes out clean then it is ready, or put it for two – three minutes extra. Always fold in the flour. Too much beating while adding flour will spoil the cakes texture and softness. Involve your children. Let them learn the basic steps in baking. You may also try Chocolate Biscuit Pudding with your children, which is also a simple dish. Thank you ma’am. I’m a beginner. Will defenitely try this. Thanks Vineesh. This is a simple recipe and ideal for beginners. Let me know how it came out.